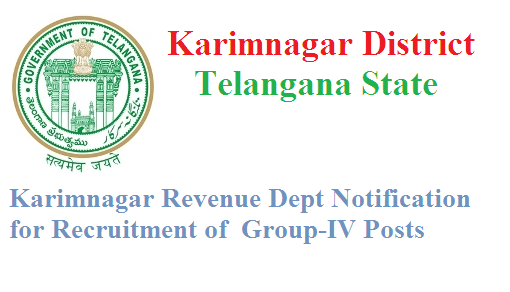 Telangana State Govt Recruitment Notification for Revenue Department of Karimnagar Dist in Group IV category Telangana State Govt issued Recruitment Notification for Revenue Department of Karimnagar District in Telangana for Jr Asst, Typist and Jr Stenogrpher for SC ST. Eligible candidates may Apply in prescribed Application form for those posts on OR before 10.07.2016. Candidates age should be between 18-44 years as on 01-07-2016. Age relaxation is applicable to widows, Divorced women, women judicially separated from their husbands and who are not married, not exceed 45 years in case of SC, ST. Candidates should be passed Bachelor Degree or any equivalent for Jr Asst, Bachelor Degree or any equivalent with Government Technical examination in Typewriting by the Higher Grade in Telugu in Government standard Key Board for Typist, Bachelor Degree or any equivalent with Government Technical examination in Typewriting, with Government Technical examination in Shorthand by the Higher Grade in the relevant language for Jr Steno from any recognized university. Eligible candidates send their application in the prescribed format , two passport size copies of recent photographs, attested copies of all relevant certificates as mentioned in the notification, self addressed & stamped envelope of size of 12×28 cms & envelope should be superscribed with Application for the post included in Group-IV services examination should be sent by registered post to the District Collector on or before 10-07-2016.